The rise and rise of internet shopping seems unstoppable. You can find virtually any product you need and have it delivered. Simple. What do my competitors do to increase conversion? Our competitor tracker software can see that there are retailers still relying on outdated delivery methods, clearing the way for competitors with improved service to step in a take the sale. For many, the delivery is based on a chain which involves retailers entrusting a consumer’s package to a logistics company. It’s loaded onto a van, taken to a national hub, then a regional hub then sent out for delivery from the local depot. Track said parcel, and you’ll probably find it’s clocked up more miles than you have that month! It can seem very wasteful to have a parcel heading up and down the UK a few times before it reaches you, but that’s the way logistics work. Is it that inefficiency really what we’re stuck with, though? It seems unlikely, as companies are already looking at hi-tech alternatives. Is drone delivery the future? On the extreme side of the spectrum, California-based business ‘MatterNet’ specialises in medical supplies and specimens, and they’ve recently taken the first tentative steps into the world of drone delivery. These unmanned flying robots can fly direct from A to B, without worrying about getting stuck in traffic or inclement conditions. It’s not just goods they entrust to drones, either. Their drones carry blood samples to labs, allowing scientists to start work straightaway. The company is also trialling drone delivery of medical supplies to disaster zones, where it would be difficult to get a lorry load of bandages and equipment to physicians treating the wounded. Of course, there are limits to a drone’s capability. 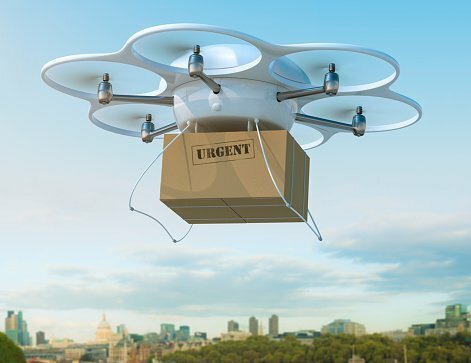 Battery capacity means drones can only travel short distances, so fulfilment centres would only be able to deliver to relative locals via drone. There’s also the weight limit – it seems unlikely that a little quad-copter drone would be able to deliver your new washing machine. Competitor Monitor’s price comparison software is able to identify every one of your competitor’s shipping rates and service. We can see that Amazon are still the biggest name in online shopping, and thanks to their delivery options, there’s a delivery service for everyone’s needs. Free shipping over £20? They offer that. Free next day delivery for Prime subscribers? They offer that, too. A particular delivery time on a day of your choice? They can arrange that for you. We all like a good deal, and free delivery at a time of our choosing is spoiling us all rotten. This is surely the future of online delivery. The problem is, once we’ve got a taste for the “I want it now” lifestyle, anything less than that is now classed as undesirable. Expensive shipping costs, no online tracking service and no guarantee on your purchase’s arrival date is really off-putting. Let’s imagine that Lucy wants a pair of trainers. Shop A sells them for £30, with free next day delivery. Shop B sells them for £25, but it’s £5 for postage, and delivery is within two to three days. The total cost is the same, but given the choice of sitting at home for three days in the hope your new shoes may turn up, or purchasing from a retailer who can guarantee you’ll be wearing them tomorrow can swing the deal of a dithering buyer. It’s this kind of data that retailers can utilise to their best advantage through Competitor Monitor’s price tracking tool. Of course, with the advent of digital items, such as music or game downloads, which can be delivered to your computer in seconds, we’re already enjoying an instant gratification system. Perhaps one day all our goods will be beamed across to us this way. After all, a lot of the space age innovations imagined in 1960s sci-fi are already with us. It’s only a matter of time until the technology turns those futuristic delivery dreams into reality.